It feels good to work for a school district that not only supports creativity but also gives their teachers the tools they need to become successful in administering that creativity. I am currently teaching my first semester of Film and Literature (a senior elective), and as I began to plan my units, I was struggling to select literature to accompany my film choices. Last week, I allowed my students to vote on and select the four film genres that we would be studying this semester, which made the selection of my literature choices stressful since I needed to select my readings and create the syllabus as soon as possible. As I sat at home that night reading comics that I had picked up from the comic shop the day before, some creative page layouts of those comics had me considering graphic novels as companion texts to the films that we would be watching; after all, the discussions brought about by film should transfer almost seamlessly to the graphic novel. After all, graphic novels seem to work as film storyboards. We can discuss coloring/lighting, panel layout/angles, costume design, dialogue, pacing, and much more. In my last post, I mentioned that I was preparing to review Josh Neufeld’s A.D. New Orleans After the Deluge, when I paused to do a 30th post special. Since then, not only have I decided to use Neufeld’s book as one of my companion pieces to my “Documentary” unit in my film class, but I’ve also had a class set ordered, and thirty-two copies should be delivered to my classroom any day now; I’m really excited! Once again, it’s great to have a supportive administration. 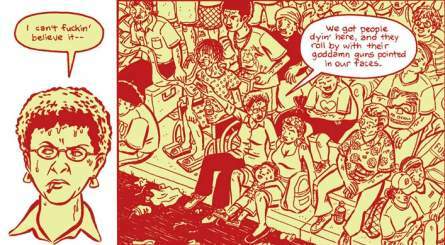 If you are not familiar, A.D. is a beautiful, eye-opening, comic-reporting of Hurricane Katrina survivors. Neufeld uses monochromatic color schemes, large panels, and a great number of close-ups to bring the reader into lives of these survivors. Neufeld’s jumping back and forth between tales helps to create suspense and an interesting story-structure…all of which companions the conversation of film very well, or at least it should (this unit will be taught next month). As I progress as a comic book teacher, one of the strengths, that I’ve noticed, of graphic novels/comics seems to be their versatility. For example, if we look at Neufeld’s book from a lesson planning standpoint, this book is simple enough in structure to engage struggling readers, but its thematic content and artistic construction also make it adaptable for the AP classroom. The book is strong enough to stand alone as an individual instruction piece; and it can be read quickly, which makes it a fabulous work to pair with other books, essays, or short stories. The only issue with the book is the number of F-Bombs that it contains. While the adult language is justified and certainly comes from a place of reality, some students, parents, and administrators might have an issue with it. Using this book with seniors, I should have no issues; however, before you run out and order a class set, read it for yourself and see if this book is right for your school, district, and classroom. Seriously though, if you have not, please check out this book, especially if you are an educator that has not yet considered using comics or graphic novels in your classroom. I’ve had a good history with turning non-comics peeps on to comics, and I’m certain that this book can change some minds. Let me know if you have any questions or need any help with classroom adoption or lesson planning. In a few weeks, I’ll post a follow-up to this post to let you all know how it went with my seniors. I’m expecting great things. I will check out A.D. Have you pulled in Zeitoun as a supplemental text for this? There is a great conversation to be had about that book, and the effects of PTSD of Katrina survivors if you pull in his (Zeitoun’s) later arrest for domestic violence.